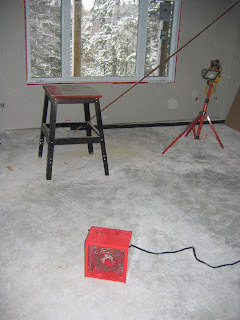 I just have to tell you how amazed I am with the construction /contractor heater I purchased at Princess Auto. This little electric heater may be small but it punches a big punch when it comes to making heat! It is under a foot square, but is able to heat the entire cottage. The heater is of course a 220-volt heater, so we needed to connect it to the dryer outlet. I keep the heater set at about 3/4 on the thermostat and it has kept the cottage at a very comfortable temperature for the past week. Well it is approaching winter here an it is nice to work in the warmth - but the big reason is that we are about to have the drywall taped and plastered, and that can not be done in the cold. Over the month of December, yes December, we are hoping to complete the drywall, install the electrical fixtures, the laminate floor, kitchen, and bathroom.